Call for nominations – Nominations are open to all women lawyers, legal practitioners, in-house counsel, candidate attorneys, final year law students, academia, NGO’s, legal advisors in business and law firms practising in South Africa. 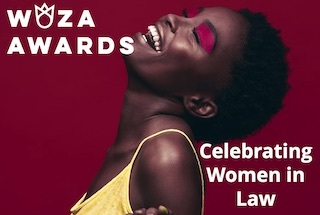 ☐ WOZA awards the WOZA ICON award to a woman lawyer who displays iconic achievements embracing thought, innovation, leadership, empowerment of other women and contribution to the law. A woman who is distinguishable from the listed individual categories above, because she exemplifies leadership and is regarded as a trailblazer. The nominee shall outline all experience and achievements relevant to the category demonstrating why she/the firm is the best candidate for the award, and only post qualifications required, limited to two A4 pages. Circulate this email amongst your colleagues and peers, thank you.